The first reactions to the latest entry in the DCEU were glowing, but now the critics have weighed in with their reviews for Shazam! We rounded-up some of the best ones to see if the unusual story of a young boy bestowed with amazing powers lives up to the initial hype. They paint a picture of a joyous, funny, action-packed film that is also a tender story about family, with the superhero genre's very own answer to Big. We're starting with our very own Kyle Anderson, who says that while the atypical superhero movie delivers on the comedy promised by its trailers, it's so much more than that. "The trailers for Shazam! have all showcased the film's humor, and that is certainly the film's biggest draw and very best piece. But what they don't show is the heart and the emphasis on togetherness and family, something I wasn't expecting. While the jokes are made at the expense of Billy and of superheroes, it never makes light of Billy's lonely, troubled childhood nor his desire to find his people. You might expect to get bored any time Billy is in Billy mode, but you don't, and that is a huge bonus." Lindsey Bahr at the Associated Press says not to worry about superhero fatigue, because the movie is a joyous experience, even if it's not perfect. "OK, so it’s basically “Big” with superheroes and villains instead of businesspeople and girlfriends, but director David F. Sandberg has infused his film with so much heart and charm that it hardly matters. Even the deficiencies, like the sluggish beginning and the random, ridiculous villains, fade away under a haze of goodwill because unlike so many big spectacle action pics with sequels in mind, “Shazam!” actually sticks the landing." Mashable's Angie Han wrote the film's "batty" premise, even for a superhero movie, is kept grounded by elements like Billy's troubled childhood. 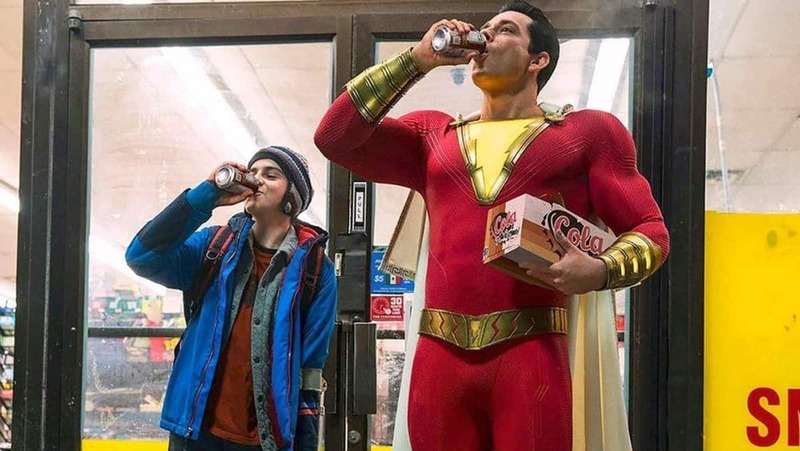 "It's unexpectedly rocky emotional terrain for an otherwise sunny film about the sheer fun of getting real big and punching out bad guys in front of adoring crowds, but Shazam! navigates it confidently, letting organic character development take the lead and striking a balance between humor and heart. And in the end, it fits, because that's another thing Shazam! gets right about kid stuff: It knows that being a child can be really freaking complicated sometimes." At Vox Alex Abad-Santos says the film soars thanks to its commitment to celebrating childhood joy and exploring feelings about family and being a parent. "Sandberg has found success in Shazam by shrugging off typically cumbersome grimness and ignoring a need to fuse together with other films for a future team-up epic — all that stuff that weighs down most superhero movies. Instead, for large parts of the movie, Shazam unfurls like a holiday movie spin on the genre. And in embracing earnest glee and heartfelt tenderness, Shazam allows us to fully appreciate the magical excitement and wonder that superheroes can supply." Know that "magical moment" when a superhero story clicks? Hoai-Tran Bui at /Film writes all of Shazam! feels like that. "A raucous, charming kid adventure that is a delight to behold from start to finish, Shazam! feels like a throwback both to ’80s comedies and to the superhero movies of the early 2000s, with abundant callbacks to both genres. But rather than playing like an appeal to nostalgia, Shazam! is more of a spiritual throwback that captures the sincerity and silliness inherent in the superhero genre, while delivering a heartfelt story about the power of found families." Despite a few "hiccups" along the way, Germain Lussier of io9 thinks the film succeeds because of how it balances a superhero story with a family drama. "The delicate blend of both those stories is what makes Shazam shine. Sure, it’s fun to watch Billy fly and shoot lightning out of his hands, but it’s even better to see him trying to find ordinary happiness. There’s a real humanity to the foster family aspect of the story and it ends up paying off with some big surprises and possibly even a few tears." Owen Gleiberman at Variety has high praise for the film's star, whose performance he compares to Tom Hanks own star-making turn in Big. "In Shazam!, Zachary Levi brings off something so winning it’s irresistible. He plays a square-jawed, rippling-muscled man of might, with a cheesy Day-Glo lighting bolt affixed to his chest, who projects an insanely wholesome and old-fashioned idea of what a superhero can be. But he’s also playing a breathless teenage kid on the inside, and the result of this body-morph balancing act is that the character, Shazam, is at once boyish and manly, wide-eyed and wizardly, ridiculously corny and heroically hip." EW's Chris Nashawaty's thoughts were more split than others, finding that the movie was at its best when it was something original and different, and that it struggled when it felt the need to include normal superhero movie elements. "Whenever Levi is on screen, wowed by his new grown-up physique (his muscles seem to have muscles) and shocked by his newly discovered powers (living lightning zaps from his fingertips), the movie soars. It’s like watching the best scenes in the Spider-Man movies, when Peter Parker first discovers he can shoot webs and turn the city into his personal slingshot tumble jungle. The problem is that those scenes — as giddy and full of youthful, caffeinated energy as they are — aren’t enough in the modern blockbuster way of doing things. You can’t just have Shazam! be a movie about Billy Batson, a streetwise 14-year-old foster kid (played by former Disney Channel star Asher Angel), and his mighty alter ego. It also has to be, well, “a superhero movie,” with a stock villain, some random wizard, a glowing whatzit MacGuffin, and a menagerie of CGI monsters that look like they weren’t good enough to make the cut in the original Ghostbusters." At IGN Jim Vejvoda favorably compares the film to a beloved film from a very different era of superhero movies. "Shazam! is DC’s most joyful and sweet movie since the days of Christopher Reeve’s Superman, a funny yet earnest coming-of-age story about a boy who learns that, well, with great power comes great responsibility. So obviously, Shazam! doesn’t reinvent the superhero movie, but it’s an undeniably fun time that left me wanting more big-screen adventures with these charming characters." What's a word that means something is funny, tender, and action-packed? From these reviews it sounds like Shazam!